Find artworks, auction results, sale prices and pictures of Crisostomo Martinez at auctions worldwide. MARTINEZ, Crisostomo (1638-1694). 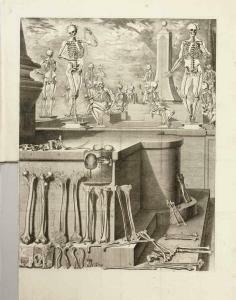 [Osteology and Myology]. Complete suite of 2 large engraved folding plates. Paris, n.d. [ca late 18th century]. Osteology plate (703 x 528 mm), sheet (804 x 588 mm). Myology plate (685 x 520 mm) sheet (825 x 590 mm).